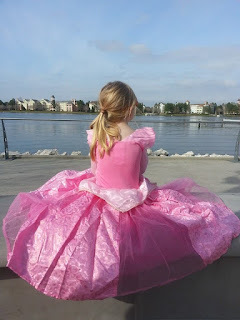 Ok, not exactly the confession of the century, but, I've been reading a number of posts lately that are very critical of sharing stories about fairy-tale princesses with their daughters. Why? Because many of these stories feature princesses that are rescued by a prince. And many argue that this sends a message to young girls that they need a man to get through life. I consider myself a strong an independent woman. Yes, I am married, but not because I didn't think I could survive without a husband. I love my husband, and we each bring our own strengths to our marriage. I know, I've written about this topic a few times before, but I also know that the more I share my story, the more I help spread awareness. I am a HELLP syndrome survivor. HELLP syndrome is a severe form of preeclampsia that can be potentially fatal for mom and baby. I am happy to say that my daughter was born healthy, and I, after treatment, also ended up OK. The signs and symptoms of HELLP syndrome are sometimes ignored or not recognized - in my own case, I chalked them up to "typical pregnancy symptoms". I did not experience all of these symptoms, but I had some. Unfortunately I ignored them as I thought they were typically pregnancy pains and discomforts and my doctor did not seem concerned.